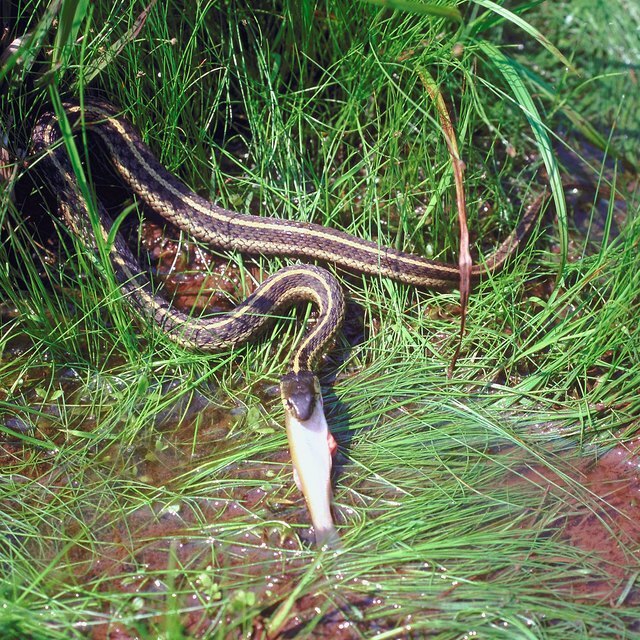 Since most snakes eat meat, these reptiles are aggressive when seeking prey for their next meal. When it comes to confronting humans, though, many Lone Star State snakes slither away to avoid a fight. However, some Texas venomous and nonvenomous snakes are up to the challenge and will stand their ground when threatened. The most aggressive Texas snakes will not even give their opponents time to back out of the confrontation. Two of Texas' rat snakes – the Texas ratsnake (Elaphe obsoleta linheimeri) and black ratsnake (Elaphe obsoleta obsoleta) – are much more aggressive than their immediate relatives. When threatened by humans, Texas and black ratsnakes will immediately attempt to bite their opponents. Aggressive black ratsnakes will imitate venomous snake behavior by wagging their tails at humans or predators. Also, Texas ratsnakes are adept at swimming and climbing trees to pursue their prey. Texas and black ratsnakes only remain docile around humans if humans do not move quickly. Black ratsnakes are completely black, while Texas rat snakes are beige with dark brown splotches. 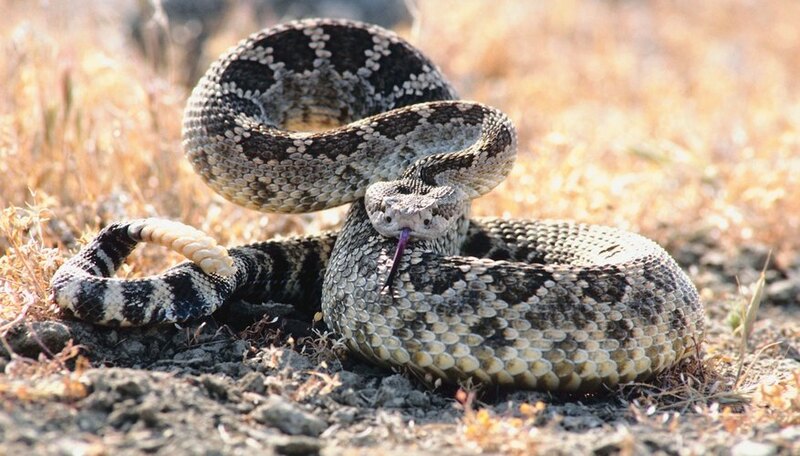 Texas' rattlesnake species in the Crotalus genus are timbers, northern black-tails, Mojaves, mottled rocks, banded rocks, prairies and western diamondbacks. When humans encounter these snakes, the rattlesnakes shake their rattles – attached to the end of their tails – and crouch in a defensive pose. If humans do not immediately back away, these snakes attempt to bite with their venomous fangs. Rattlesnake bites may prove fatal to humans if they do not receive medical attention. The largest rattlesnake in Texas is the western diamondback (Crotalus atrox), which grows up to 7.5 feet. Crotalus rattlesnakes have triangular heads and slit-shaped eye pupils. The Texas indigo snake (Drymarchon corais erebennus) also lives in the Lone Star State. While they are relatively calm in the winter, the hot Texas summer brings the ire out of these snakes. Before standing in a defensive pose, Texas indigo snakes release a musk to ward off humans. If humans do not heed this warning, this snake flattens its head and shakes its tail to make it appear like a venomous snake. Texas indigo snakes will bite if other warnings fail. Another aggressive nonvenomous species is the speckled racer (Drymobius margaritiferus). This snake may be identified by it slender body, ridged scales and speckled color patterns. Speckled racers bite almost instantaneously if humans come too close. As their names suggest, the inside of the western cottonmouth's (Agkistrodon piscivorus leucostoma) mouth is completely white. Western cottonmouths have long hollow fangs with venom. Unlike nonvenomous water snakes – who run away from humans – western cottonmouths stand up to their adversaries and flash off their white mouths as a warning. If humans do not back away from the western cottonmouth, it will attempt to bite. Two of Texas' massasaugas – desert (Sistrurus catenatus edwardsii) and western (Sistrurus catenatus tergeminus) – have shorter fangs than western cottonmouths, but some specimens also have shorter temperatures. Although they are usually mild-mannered, some massasaugas act violently if they feel threatened by humans. Massasaugas are small rattlesnakes in the Sistrurus genus. Davis, Skip. "Aggressive Snakes in Texas." Sciencing, https://sciencing.com/aggressive-snakes-texas-8782939.html. 24 April 2017.